ARCHIVE ABOUT CAST WORLD STORY GALLERY STORE LINKS RSS This page is not necessary to read Between Places. In fact, it's really just a ton of information on the setting and stuff in great detail. Just in case someone wanted to read it. -The Real World, in short. ---Magic in the real world. ----The History of the Order. The year is 2323 MST. Between Places is set within an elaborate labyrinth of dreamworlds, the Nightside, created by the dreams of dreamers, whose dreams take on lives of their own. On the other side is the "real world", which the Order as well as all dreamers originate from. Seperating the dreamworlds from reality is the Between Place. Dreamworlds are an aftereffect of dream magic. With control of dream magic, they can be altered and shifted. When someone dies in a dreamworld they generally wake up. If they cannot wake up for some reason or another they will end up between places, and the dream will drag on uncontrollably. If a dream ends and someone cannot wake up, again, they will end up in the between place, occasionally referred to as the aether or the nether. Dreamworlds are occasionally referred to as the mythos. Dream magic's rune looks similar to an eyeball. It's particularly common among Vilanars, but the ability to enter and exit dreams can be learned by people who aren't dream magicians, by using other abilities as a lift. In reality dream magic is nothing more than illusions but using the power of Mind as a backing it can be used to make very real illusions, and ultimately, dream worlds. Rules of magic in the Dreamworlds. In the dream world the rules of magic are bent, but spells still must always be cast using an element. Depending on the area, the caster may be weakened by elemental influences of a negative kind. A fire spell will not be easily cast in a watery place but will be strengthened in an earth place, at the cost of the earth magic. The length of time it will take to cast a spell depends on the strength of the caster and the complexity of the spell. Magic will always be drawn from the heart of the dream in a dreamworld, and is much less likely to weaken someone in a dream, unless the dreamer themself is casting in their own dream, in which case every spell cast will weaken them. If blocked from the heart of their dream, a dreamer will be mostly useless in their own dreamworld. Dreamers are meant to be bystanders only. The Maldlahin are the personifications of the elements. If there isn't a Maldlahin, there isn't magic. In order to humanize themselves, all Maldlahin are bound to a single mortal guardian. While Maldlahin are psuedu-immortal, they can still be killed or worse, lose all of their humanity and simply be absorbed back into the magic which spawned them. If a Maldlahin is killed, as a general rule their guardian will take their place as the Maldlahin of whichever element. Falahil is a dreamworld. It's far younger than Mysada, and therefore much smaller. In fact, it doesn't consist of much more than a forest and a city encased by mountains. Its heart is found in a clearing beside a small lake, surrounded by mountains, sun and trees, and appears to be some sort of a crystal picture. It was claimed by E.L.F.s--this time appearing as vampires rather than traditional elf-kind--and the dreamer trapped in a summon (a dragon form). Gabriel was sent to Falahil to find its heart and hopefully clean it of the evil killing it off. Falahil is dreamed by Rease Nalive. Mysada is one of many dreamworlds. Like all dreams, it has a heart. Mysada's heart is located in Adhaled, which means "House (of) trees" in the language Ekaeli. Like most dreamworlds, it's nowhere near the size of a real planet. It consists of two small continents and several scattered islands, and if you were to sail the ocean, after a while it would simply fade into black. Perhaps you'd sail over the edge or come around on the other side. Nevertheless, though it has no real-world physics, the tides come and go as if it were so. Mysada has two moons. Balarn is one of the few named human cities so far, and it's a half hour out from the wizard's tower. The wizard's tower is a bit of a joke, as it's not much of a tower at all. There are several glass towers spiking out of it, used for astronomy, but most of the building burrows deep into the mountain it's constructed on. It's a half day's ride from the capital city (so far unnamed) and a convenient garrison for the King's troops--which consist of solders gathered from across the country and of the Order of wizards, as they'll probably have to go east through the mountains to get to Adhaled if they're going to reclaim it. Dayun has been summoned to Mysada to aid in the attack on the elves holding Adhaled, to free Mysada (who's currently been in their hands for the last several years). The dreamer is currently unknown. The Between Place exists between reality and the dreamworlds. It is an orb split into six regions and a heart. Each region is affiliated with one of the physical elements: earth, air, fire, water, light/ice, dark/metal and one of the metaphysical elements: mind, dream, memory, time, order, and chaos. It can be lived in, travelled in, but mainly it contains the echos of dreams and supports dreams gone rogue. The White City can only be accessed from Between Places. E.L.F. is the Order's shorthand branding for Extrodinary Life Forms. Though this should extend to include their own men and women and the Maldlahin, they ignore this and tend to only apply it to the evil lifeforms, who, true to their name, tend to take on the appearance of elves--pointy eared, long haired, long living fantasy creatures inspired by Tolkien. Not all of them, however, adhere to this physical standard. Vampires and werewolves and fae creatures are also common for the E.L.F.s, and to some lesser extent, monsters and demons and angels. They always appear as an extrodinary or mythical creature, never a mere human. E.L.F.s are nearly always extensions of the Vilanar family from the "real world". The Real World, in short. The real world is real. What did you expect? It includes Almaera, Carmen and the galaxy, each with their own rules and culture. Magic is much more stringant in the real world. Almaera is otherwise known as the Shadow Realm. A tenative part of the real world, it is the originating point of most extrodinary life forms. It's a known fact to the Order that most "extrodinary life forms" in the dreamworlds are members of the Vilanar family, who have an abnormal talent for dream magic. Almaera has a few continents, but the main focus is the north continent, consisting of several minor provinces and two countries. The Fall occurred a few years after Metruis was occupied. It had something to do with magic and technology. As it took place a few thousand years ago, not too many people live who remember it. After the Fall, things went crazy and most of the technological advancements were lost. However, they retained their culture and slowly rebuilt over the years, even though the planet was a lot worse for the wear. The Vilanar family is notorious for their ability to use dream magic, and for being the only organization still using pre-Fall technology. They're not sharing, though, and they remain the only people in the real world with cloning and stasis perfected. As they're rumored to use necromancy they're not well trusted on Almaera, even though they've got the best medical facilities in the country. The Order's well aware that the Vilanar family is behind most of the extrodinary life forms trying to cull the dreamworlds back down to a managable size. They have extreme family values and it takes a lot to drive one Vilanar to act against another, even if their values clash. They very often work together as a family clan--much to everyone else's dismay, as their goals almost always clash with the Order's and the Royal's. The Vilanar family climbed up into a higher position on the social scale eventually, and they are reluctantly acknowledged in their political position, though not necessarily loved for it. Saerin is the oldest member of the Vilanar family, and may be the only person in existance besides Dream himself who knows how to fully command the dreamscape, though her granddaughter Almarien is certainly trying. She was born pre-Fall and is an example of perfected cloning technology (and possibly dark magic). Like the timeless Vilanar family, the Elass family has mainly held the seat of power through their firstborn son and daughter since the time of the Fall. However, the Calthye is very rarely an Elass--a third ruler elected solely by power, an empathic bond to the country itself, generally born with the Mind rune somewhere on their body. The Calthye is an accepted member of the royal family and part of the Crown, but only in lieu of a king or queen is their children or signifigant other counted as royalty. If the Calthye is not born into a family of power, they are often not found. The Calthye is considered to be of the Mind magic by scholars of magic. Ekaeli is the common language of Almaera and frequently used by anyone with an Almaeran history to cast spells in, as it contains words for the magic runes that the Galactic Common Trade language doesn't include. Magic in the real world. In the real world, magic suffers a lot more limitations, as it is drawn from the environment and from the caster. There's no dream hearts or planet hearts in the real world, and spellcasting in the real world can kill if overdone. Elemental magic draws from the environment, Ordered magic draws from the caster, as does any of the six metaphysical elements. Magic can be cast through words, gestures or thoughts--it's mainly by intent, but directing that intent can only be learned from the original words. Ordered magic doesn't suffer this limitation and many people born with Ordered powers have little to no control over their natural abilities. The other elements, however, have a much higher learning curve. Though all magic can be learned without an inborn ability, it takes years of study and knowing the magic words, runes and structures to draw from the environment. 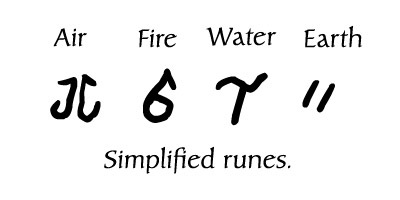 Basic magic is cast from a simple magic construct made of the six elemental runes. With this, anyone can write either a ward or a jump point. It's using the jump point that's the difficulty and it takes many years of study to be able to teleport to one. The Order's written several of these points to create otherwise impossible to access areas. These are often referred to as threads. There are six true elements: mind, dream, memory, time, order and chaos. Depending on which planet you're on, these will be classified differently. 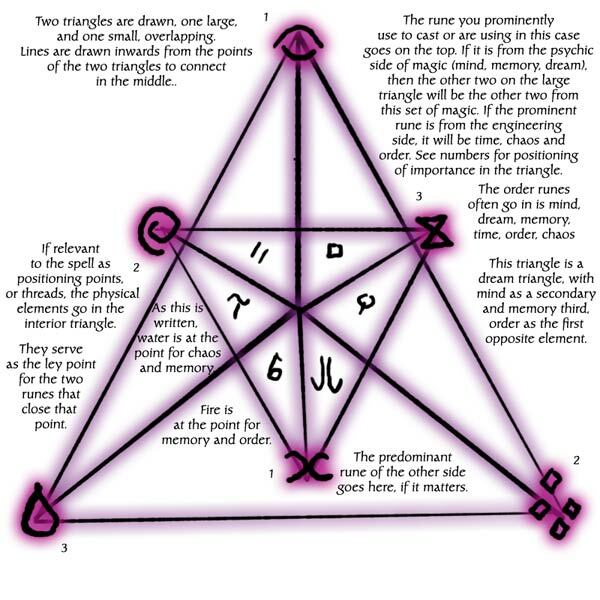 The Order simply refers to other elements as magic and their own abilities as mutations, whereas the planet Carmen's system splits into "engineering" and "psychics", engineers being of the time, order and chaos side and psychics being of the mind, memory and dream side. Almaera refers to the elements by much more in depth names, detail and ability. What a Metruisian from the Order would refer to as a mutation, an Almaeran would likely refer to as an Ordered power, and a Carmenian would refer to as a psychic. The references in the dreamscape itself depend on the culture of the dreamer. 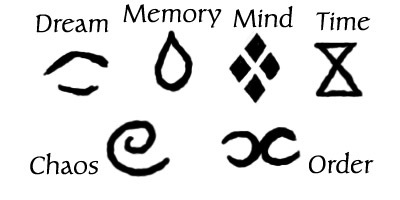 These are the simplified runes generally used to represent the elements and spellcast nearly universally, though they are Almaeran in origin. One more incidence of magic exists, and that is wild magic. It has no element or rules and cannot be controlled. It congregates in areas, and is known for causing people to be born with amber eyes and doing really freaking weird things to the environment. The real world has six Maldlahin of their own to represent the six metaphysical elements. Not all of these Maldlahin are self-aware, and neither are their guardians. If they die unaware the role simply passes on. The Maldlahin are weakened or strengthened by their intractions with each other, and most of them stay neatly out of view. Metruis is another piece of the real world. It's currently the headquarters for the Order, as well as one of its moons. The Order is too important for a name, and intergalactically feared in the real world. In their galactic side of the organization, they will entirely deny that they believe the existance of magic and alternate universes, but their group of top level access special operatives agents walk the line between fantasy and reality. Talnaver, Gabriel, and Dayun are three of these agents, working under the elusive Foreyes. Ordered agents have a single ability based on the properties of telepathy, transmutation and telekinesis. Talnaver, for example, is a mild telepath and can implant suggestions and name people, whereas Gabriel as a mutated transmutant can stop time. The organization of Special Operatives are simply referred to as having Level Eight access. Unlike most of the Order, many of them can use true magic rather than just magic under the element of Order. To keep their agents safe, many of them have never met and only communicate from behind screennames and a server of internet and garbled and encrypted phone messages. They seperate under leaders, leaders simply being people who've located others with magical abilities beneficial to the Eighth Level and taken them into their group. Many within groups have still never met their colleagues. Talnaver, Dayun and Gabriel are all part of the same group under code name Foreyes. Other groups include Loki's and Phantom's. The History of the Order. The Order was created shortly after the fall by the Maldlahin of Order, Elion. Though he was killed by Saerin Vilanar, his legacy lived on and the Order grew from a safehouse for those with strange abilities to later control most of the galaxy. The technological level of the Order surpasses Almaera's. It is slightly beyond our own. Even now things pre-Fall are discovered to have been much more advanced than they are now, as technology before the Fall combined magic with technology, something now fairly cleanly split between the galaxy and Almaera. The special operatives carry some simple perversions of technology to be able to contact one another in the dreamworlds. The galaxy is a large place. Other known planets include Cabruin, Meles, Arbrecht, Carmen and Rislan.